Here in the Cape, thunder storms don’t occur very often which means that it might be quite a while before you discover that your dog suffers from storm phobia. Besides being traumatic for your dog, it can also be traumatic for you as your dog may escape from your property, do serious damage to himself or damage your home. Dogs have been known to end up with broken claws, cuts, broken teeth and bruises. They have also been known to chew through door frames, brake window and scale walls. Choose your pup from a breeder who makes an effort to expose the litter to noise from the day they are born. Expose your pup to loud noises regularly from the day you get him. Give treats to create a good association. Do not fuss if your pup does show fear as he will see this as praise and become more fearful. The first time it is stormy, go and play with your pup outside in the garden. He will never be relaxed about storms if you bundle him inside at the first sign of bad weather. Have your dog live inside. Outside dogs suffer more often from storm phobia as they cannot escape from the noise. 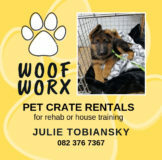 Crate train your pup. 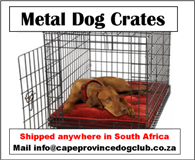 The crate provides a perfect safe haven for any stressful situation. When your dog first starts showing signs of fear, distract him with something he really enjoys like a game or a favourite chew. Let him hide in his crate as he will feel safest there. Place the crate in a small room which is enclosed (like a bathroom). Cover it with a cloth and play some music or a radio loudly. Some people swear by natural remedies like Rescue Remedy, Pet Calm or Lavender oil in a diffuser. Chat to your vet about the use of medication to manage extreme fear. Record the sound of thunderstorms and play at a low volume while your dog is doing something fun. You can increase the volume gradually. Have your dog wears a collar with an engraved disc with your contact details on it, at all times. When the weather forecast predicts stormy weather, do not leave your dog outside when you go out.